If three famous rock musicians like singer John Lawton (Uriah Heep), singer Joseph Williams (Toto) and drummer Simon Philips (ex-Toto) decide to record a CD with the Bulgarian composer and producer Dr. Milan Vrabevski, you may expect an excellent album. After listening to this record by Intelligent Music Project II a number of times, I could draw the conclusion that the days of playing hard rock are long gone for these old musicians. My Kind O'Loving mainly consists of acoustic ballads with romantic and positive lyrics and only a few up-tempo songs. Take for example the title track which sounds like a typical song by Crosby, Stills & Nash: close harmony singing accompanied with only one acoustic and an electric guitar. It's certainly not innovative, but played and sung very well. The lead singing in Friends is done by Joseph Williams; it's more an up-tempo song in the vein of his former band Toto. The AOR-sound of the guitar makes it even slightly better than Toto. The cheerful song No One Can Deny It sticks to one's memory immediately; it feels like being back in the eighties again. The Toto feel returns in the reggae kind of song Get Into Real. Simple Game is one of the best pieces in which John Lawton sings almost solo accompanied by a large orchestra. He still reaches easily the high notes. The sound of a Spanish guitar played by Ogi Veskov introduces the next ballad Happiness on which the close harmony singing is almost perfect, but the Latin feel of a band like Santana is never far away. The intro with a grand piano in Things We Can't Do sounds like the music of a romantic American movie like Love Story. Uriah Heep had recorded several similar ballads when Lawton was the singer of these hard rockers. The dramatically arranged orchestra is another highlight on this CD. For a moment I thought that I heard a new version of Smoke On The Water (Deep Purple), but this wasn't the case. However, Time To Move Along also rocks from the beginning until the end. The piano arrangement by Yassen Dimitrov in Love Song sounds almost classical, but the biggest surprise in this piece is the electric guitar solo by the Bulgarian guitarist Sverry (S. Kolev). The orchestra returns in People On Fire. The best elements in this dramatic song are a short guitar solo in the vein of David Gilmour, a blues guitar sounding like Gary Moore together with some beautiful singing. In the easy listening and optimistic song Step In Learning, Williams does the lead singing again. It sounds like what we call at home radio-friendly American west coast music (FM-music). If you like The Eagles, Pablo Cruise and close harmony singing, you most likely love this song. Understand The Morning sounds quite alike with a similar vibe, but now Lawton is the lead singer. Conclusion, the final, the longest and in my opinion also the best song contains some nice surprises in the middle-section and at the end: it sounds like 'Queen meets Alan Parsons Project', but it contains also a drum, bass and Hammond solo, all performed in less than seven minutes. Well done! 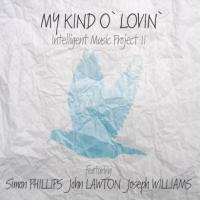 My Kind Of Lovin' by The Intelligent Music Project II contains thirteen tracks without a weak one or even a weak spot. I think this is a big compliment for Dr. Milan Vrabevski and all the musicians evolved who helped him to record this fine album.